Rania Matar- "In her image"
I strongly suggest avoiding such art-selling venues as eBay, cruise ships, travelling hotel art auctions and late-night television art auctions. Generally speaking, the products sold in these venues ranges from ‘decorative-only’ reproductions to outright fraudulent items. There are exceptions, of course. Not all that is sold online is bad. But, unless you are a seasoned collector who has deep knowledge of what you are buying, the combination of your naivete and the fly-by-night dealer’s incentive to sell you high-priced wall décor using trumped-up or tricky descriptions is a bad combination. These venues offer none of the advantages a good dealer offers collectors… knowledge, in-person examination, etc. Collecting art is a learning process. One does not develop connoisseurship on the sidelines. The world of art is fascinating and has its own lingo. That can be intimidating and it can be a minefield for the uninitiated. I always suggest that prospective collectors spend time learning about art, going to openings, asking lots of questions from reliable dealers, looking, looking, looking. It might be wise to start collecting with good brick-and-mortar gallery dealers that have been in business for many years. Whether your area of interest is contemporary or traditional, you will find such dealers in most major cities. Go to gallery night openings. Meet artists or go to experts’ lectures hosted by the galleries. Go to vetted outdoor art fairs where the artists are there to meet and buy from directly. All of these activities are fun and put you in the same room with the art and with experts who adore talking about art. You see the works in person…see the surface, the scale, different media, different styles and price ranges. You get a chance to figure out what style you like and ask questions from dealers who care about their reputations and who will answer any questions you have, dealers who represent a stable of living artists or dealers who have storerooms of art in their inventory. I cringe a bit whenever a new client proudly mentions that all the pieces in their collection have Certificates of Authenticity. A COA is a piece of paper provided by the print publisher or gallery to the buyers of each print. At their best, these are documents that accurately state the print’s title, artist, medium, number in this edition, a breakdown of the tirage-the total number of prints made and how they were marked, publication date, publisher’s name and other salient information about the print. At their worst, these documents are written with tricky and/or inaccurate information and are provided to naive buyers in order to paint a layer of respectability and security over the sale of fraudulent or ‘decorative-only’ reproductions by well-known artists. **Note: Certificates of Authenticity are not the same thing as a Letter of Authenticity provided by the recognized and accepted expert or panel of experts on a given artist. A Letter of Authenticity might be requested by a collector from such an expert when there is some question of the authenticity of a piece. These can be time-consuming and expensive to obtain and are only necessary in a limited number of cases. Another topic for another time. I call this a costly “mistake” because in the course of many years in the business, I have been on the selling end of these pieces and have seen the frustration of collectors when the realization hits them that the artwork in their collections will only bring a tiny percentage of the amount of money they spent. That being said, if you like to go to well-publicized events at galleries in Hawaii or Las Vegas and have your picture taken with an actor who has taken up painting, then go for it. However, if the actor’s work is exclusively carried at one gallery, be aware that what you are buying is a nice memento of a celebrity appearance. The same can almost always be said of artists whose work is sold through their own chain of galleries. The high prices can only be sustained as long as the galleries are being run and the gallery staff has been given an updated price sheet from which to quote. Since the artists are exclusive with one gallery, if a client wants to buy new work, the price is whatever the gallery quotes. However, these galleries are not interested in the secondary market at all. They have new products to sell. Should you decide to offer any pieces from your collection for sale, you will generally be hard-pressed to find a venue to do so. When the actor dies and can no longer make those appearances that drove the pricing, the value is likely to plummet. Getting 10% of the original purchase price from an online auction is the likeliest scenario. I was recently called to a new client’s home to do the onsite inspection for an insurance appraisal. Insurance companies normally require an independent appraisal of artwork prior to the owner taking rider coverage on the works. This appraisal’s purpose is to provide an independent inventory, report of current condition and estimate of the cost to replace the artwork with comparable pieces should losses occur. I had been told that he had a collection of 40-50 items needing appraisal. Sadly, what I encountered was a large collection of expensively framed reproductions by well-known artists. Since the value of art itself was essentially poster level, my advice to the client was that he should not engage my services for an appraisal. I charge hourly fees and I could not, in good conscience, ask this potential client to pay for the time it would take to photograph, describe and list a value for these pieces. By the way, each of the pieces in this collection came with a Certificate of Authenticity (See Above) and each of these COAs was written with language specifically intended to deceive the buyer. Had he called me after only a few purchases, a few short connoisseurship “lessons” would have saved all the subsequent expenditures. Collecting art should be engaging, fun and fulfilling. But finding out that you have been duped can be infuriating, especially since in many cases, refunds are difficult or impossible to obtain. We at Signet Art are at your service! Let us be your guide to collecting great art. We help our clients buy well, sell well, appraise accurately and avoid costly mistakes. I spent two days last week in a seminar sponsored by ISA dealing with the specialized needs of High-Net-Worth Individuals. The speakers were representatives of various businesses who offer services targeted for this class of clientele and who coordinate getting their appraisal needs met. As you might imagine, this small percentage of the population makes up a considerable proportion of our clientele at Signet Art; we work with individuals, museums, attorneys, shipping companies, insurance carriers and adjusters. Although we are available to help individuals with their questions about art of any value and collections of any size, our larger projects come from those who have been collecting for some time and have amassed a collection of considerable size and value. Collectors in this category are going to need more services and often very different services than the average collector. Some High-Net-Worth Individuals want to use their money to benefit future generations. Our first speaker decided to do just that. J.P. Bryan is a life-long collector of books, Texana and western art. Western history is a deep passion of his and he began to collect in the area as far back as his college days at the University of Texas in Austin. He decided several years ago to make his fabulous collection available to the public. In 2013, he purchased the historic building that had been the Galveston Orphans home for almost 100 years. In 2015, after two years of restoration and renovation, the Bryan Museum opened to the public. Mr. Bryan and Joan Marshall, the Director of the Museum, were the first speakers at our seminar. Mr. Bryan spoke about his passion for the various collections and the importance of maintaining the love of art. Ms. Marshall spoke about some of the challenges unique to housing a museum in an historic building not purpose-built for that use, including security of the art, adequate storage facilities and other challenges that arose while transforming a former orphanage into a modern museum. The collection uses both fine art and the collectibles of daily life to tell the history of Texas and western expansion. If you haven’t visited the Bryan Museum, plan a trip to Galveston soon! Abigail Rosen, an attorney with Winstead PC-Dallas, TX, whose practice focuses on tax litigation, gave a primer on communication and record keeping that will preserve attorney-client privilege and the importance of including all the IRS-stipulated requirements in an appraisal so the timeframe of the statute of limitations is not extended for noncompliance. Michael Brandstetter and Dan Rockwell of Displays Fine Art Services gave us some insights on all the services they offer that cover the logistics of owning, shipping, storing and displaying fine art. When a work is purchased, it must be packed, shipped and safely installed at the collector’s home. When items are sent for auction, the same services are needed. Seasoned collectors realize that their pieces are at their highest risk while being moved and installed and insist such services be handled by specially-trained professionals. Displays FAS also has a large warehouse space for collections storage. As an appraiser, I have become very familiar with DFAS and a few of their competitors since my clients often have items professionally stored with them. I am always grateful for the professionalism toward the art and courtesies shown to me when I need to do an inspection for a client or arrange for packing and shipping. Displays Fine Art Services has become the go-to business for dealing with monumental sculpture. They have years of experience in the area and handle all the needs for the Nasher collection and the Nasher Sculpture Center. These include transportation and installation of sculptures, onsite restoration and repairs, storage of items and more. Day two of the seminar started out with Dulany Howland, President of Howland Advisory LLC, giving an introduction to working with family offices. The term ‘family office’ was coined in the 1950’s when wealthy families first began to set up their own private offices to handle all the business and investment matters for various generations of family members. Family offices handle the business affairs, investment needs, tax filings and personal needs of wealthy families. In addition to private family offices, a hybrid has sprung up in the last 30 years, a multiple family office. Advisory firms, such as Mr. Dulany’s, offer family office services to a small group of clients and their families. Such advisors need a wide-ranging background that includes financial knowledge, business acumen, incredible people skills and a list of the best-qualified service providers in any field where their clients might need services. I have worked with a client of Mr. Dulany who had a fabulous collection of contemporary art and enjoyed hearing him describe his role with his clients. Monica Egert Smith represented the Communities Foundation and spoke about its role as a donor-advised charitable fund. Donor advised funds allow High-Net-Worth Individuals to easily contribute large amounts to a charitable fund, invest the fund for growth and set up a granting plan for the various organizations and causes they care about. Personal Property Appraisers are occasionally needed because some individuals wish to donate their treasured collections to charitable organizations through the Communities Foundation. Alan Davis, an Attorney and CPA with Meadows Collier, who specializes in helping HNWIs set up trusts, does their estate planning and estate settlement, quickly reviewed case law regarding personal property includable in a person’s estate. There are different reasons an attorney representing a HNWI might need an appraisal on behalf of their client. A well-trained appraiser needs to know the intended use of the appraisal and needs to prepare the appraisal using IRS-required standards so that a deduction of taxes for a charitable gift is not disallowed and so that estate or trust matters are settled in a timely fashion. Greg Morse of Worthington National Bank spoke to the group about banks that loan money using art collections as collateral. Such banks are rare in Texas but have become fairly commonplace in New York. When called to work on such leveraging of art for cash, an appraiser needs to be savvy enough to understand the type of value being sought—usually marketable cash value or orderly liquidation value, and needs to be completely independent from either party. Mr. Morse’s talk was a good introduction of the topic. The final speaker for the seminar—last, but certainly not least, was Barbara Chamberlain of AIG. Ms. Chamberlain is the Director of Collection Management. From that lofty position, she helps HNWIs look at the safety of their collections and insurance needs. She works with families that have multiple homes and routinely move their jewelry, their artwork and other personal items between locations. While most homeowners carry insurance on their homes that includes a small percentage of coverage for personal property, HNWIs may need to add Private Collections Insurance. Such coverage is much more comprehensive protection against loss. It usually covers natural disasters such as windstorm, earthquake, etc. Diminution of value is also covered. So, if there is a damage claim and repairs have been completed, an assessment is made whether there has been a loss of value due to the damage, in that case compensation can be made. There is usually no deductible and some policies offer up to 150% payments of the value stated on the policy if the value had appreciated since the last appraisal. High-Net-Worth Individuals have more complex financial needs than the average person. A whole industry of various providers has grown up around serving those needs. With 25+ years of experience as a fine art appraiser and the highest level of accreditation, I am often called in to meet the appraisal needs of such individuals. It is always a pleasure and privilege to be of service whenever we get that call. This seminar was time well spent, networking with the best and deepening my knowledge of how to be of service. My approach to life and to business is ABL/ ABS…Always Be Learning/ Always Be Serving! As the summer intern you are always sent out to do the nitty gritty parts; fortunately, at Signet Art that means going to the Amon Carter Museum to take photos for our newest video, coming out soon, and to see a current exhibition. As I was researching the current exhibitions to decide which to see while there, I came across “In her image,” photographs by Rania Matar, a collection of four of her bodies of work using portraiture to follow the development of female identity. I was intrigued by the small preview I found, so I ventured in after finishing my other task. Living in a media filled age, I wondered what the magnitude of Matar’s work would be because if they were near the size of my phone or laptop I could brush off the intentionality of each photograph and loop them in with the rest of the portrait media I intake from social media. Rania Matar did not disappoint. Her portrait prints are life-size and hung just above eye level, demanding most of my field of vision. Matar captures this sweet yet heavy moment of mother and daughter. Neither of the pair looks at each other but their emotional connection is displayed in their touch and body language towards the other. The daughter lovingly kisses her mother’s hand and places her other hand on her mother’s cheek, acts of comfort that are possibly more for herself than her mother. Acts her mother embraces, still being her daughter’s rock, even in her frail state. Matar beautifully captures the emotional side of the relationship without sacrificing the image composition or quality. I am drawn to this portrait because of the emotional intensity so plainly shown. It is demonstrated in a genuine manner, not dramatized but downplayed. This work could easily be passed by and likely has been in the museum and our own lives; a quiet loving moment between a mother and daughter that exhibits genuine care from both parties. For a generation addicted to posting the always perfectly posed selfies; the authentic, complex emotional relationship in this image is captivating. Another work that drew me in was from her “Becoming” series, a series of comparisons of girls and their identity, in the U.S. and the Middle East, before and during puberty. The side by side portraits of Charlotte at age 11 and 15 exemplify the key concept in the “Becoming” series; plainly displaying Charlotte taking hold of her own identity and becoming who she wants to be. These two portraits focus on her growth as an individual. The scene and set up are almost identical focusing the portrait on her change and development. At 11, Charlotte portrays an uncertainty and uncomfortable reaction to the camera, but at 15, Charlotte is relaxed and confident in her pose for Matar. She demonstrates self-confidence in body language and facial expression. She is more open towards the camera instead of balling up as in her portrait at 11. There has also been a change in the art of her room. In the left portrait there is an innocent portrait of a woman on the beach above her bed but at 15, three images hang above her bed that are much more sensual and revealing of a woman’s body. Matar successfully depicts the onset of womanhood in her “Becoming” series through skillfully capturing personalities and levels of confidence in each of the young women. Overall, one of the best nitty gritty adventures of being a summer intern. Rania Matar captures the essence of her subjects and their relationships to self, others, and the world. “In her image” will be up at the Amon Carter until June 17th, so run up there if you get a chance before the show is taken down. You don’t want to miss this. 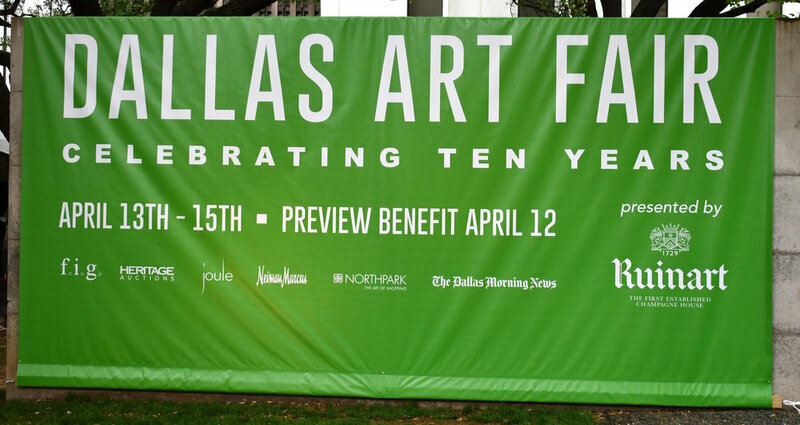 The Dallas Art Fair celebrated 10 years this April! Since its inception, the fair has expanded to Dallas Art Week and then to Dallas Art Month. With each successive year it proves to be an elite fair, pulling in galleries and patrons locally and internationally. I say it each year – this fair is a great opportunity for both collectors and art aficionados to see and purchase some of the best in modern and contemporary art from all over the world. With a decade of history, an increasing annual attendance around 15,000, huge sales, prominent dealers and big collectors, the Dallas Art Fair is not only a Texas staple now, but it has established itself as an important fair. The Fashion Industry Gallery, which has hosted the event since it kicked off in 2009, squeezed in 93 galleries from all over the globe this April. A large chunk of exhibitors were New York of the galleries – as in 35 of them. In 2016 the fair announced the Dallas Art Fair Acquisition Program, in which it gifted the Dallas Museum of Art funds to purchase work by artists exhibiting at the fair for the museum’s permanent collection. Initially the gift amount was $50,000. In 2017 the gift amount was raised to $100,000. This year, the tertiary year for the program and the 10th year for the fair, the gift has tripled in size since 2016, now to a $150,000 grant made possible with funding from the foundation as well as private donors. Agustín Arteaga, director of the DMA, and Anna Katherine Brodbeck, curator of contemporary art, advised the group this year. The museum selected and purchased works by Geraldo de Barros, Sanford Biggers, Alicia Henry, Shara Hughes, Tony Lewis, Matthew Ronay, and Brie Ruais. This is such a cool program and I am glad to see it has grown over the years. 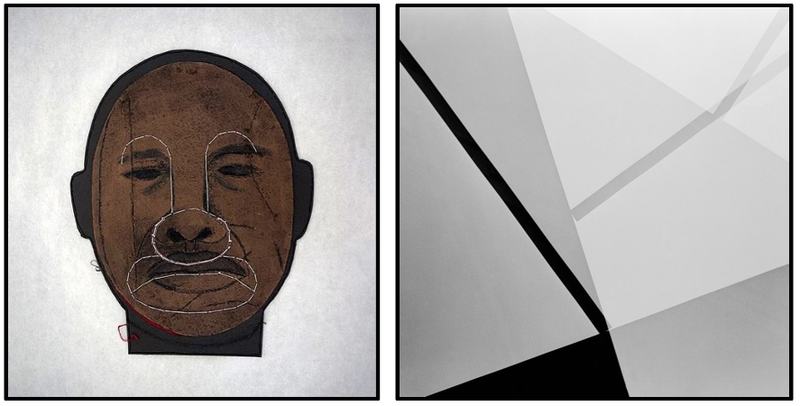 Two pieces were selected from Texas gallery artists - Alicia Henry's "Untitled" portrait is from our own Liliana Bloch Gallery here in Dallas and two prints by Geraldo de Barros were selected from Sicardi Gallery in Houston. It’s a win-win-win-win – benefiting the DMA, the fair, the artists, and the galleries that represent them. I was excited to see The Hole from New York participating this year; they were showing several works by Eric Shaw, including one huge seven by nine foot work. I was introduced to Shaw’s work through a client of ours who collects him, and I have followed him ever since. His colorful geometric abstractions are wonderful and engaging, and his process of digital manipulation and planning fits right into the post-analog painting style of many contemporary working artists. It is great to see all the DFW galleries showing – Talley Dunn, Conduit, Cris Worley, Erin Cluley, Liliana Bloch, Valley House, William Campbell Contemporary, PDNB Gallery, and for the first time this year, Bivins Gallery. I look forward to seeing the realism works from Henoch Gallery, NY (artists like Robert Jackson, Eric Zener, Steve Smulka), and the work of Taubert Contemporary and Miles McEnery Gallery artist, Markus Linnenbrink each year. Linnenbrink’s thick and layered epoxy resin and pigment on wood works, particularly those from his ‘Drills’ or ‘Cuts’ series, are wonderful; his approach to color and material has garnered him a following in Dallas. The fair was packed all weekend, even on Sunday. It is a wonderful show we are lucky to have in Dallas and shouldn’t take for granted; 10 years ago we didn’t have anything in town that came close to what the fair does. The Dallas Art Fair is still a powerhouse. Ginger Fox Gallery has opened a second location in the Dallas Design District! I always stop by their Bishop Arts location when I’m in the area to see what new paintings Ginger Fox has been working on. I was in Dallas this week to meet with a client for an install and swung by the new Ginger Fox location on Dragon Street on my way back to the Signet Art office. Ginger Fox’s work has always been original, contemporary work, and for a large portion of her career the work revolved around magical realism and hyperrealism. However, in the recent years she has branched out and, with the liberty of owning and running her own gallery, produces work in many different genres, styles, and subject matters. When you visit the gallery you can see works from all of Fox’s collections. Her floral abstracts are thick and colorful, the highly textured paint reaching off the canvas at the viewer while colors drip and blur below the abstracted bouquet. There is a whole series on water that is quiet and composed with reflective hues of blues and whites, which is a serene contrast to the hardedges and bold colors of her Curves and Line series. Currently in the gallery alongside Fox’s works, are the Swatch Paintings by Dallas-based artist Jennifer Lashbrook. Her approach to collage involves paint swatch paper arranged to create pixelated images. As her artist's statement says, “…from a distance, the colors blend to create a photo realistic quality, with the individual ‘pixels’ becoming more distinguishable the closer one views the art.” The gallery carries limited edition prints and original works by Lashbrook. Ginger Fox standing in the new gallery space! Many congratulations to Ginger Fox Gallery on the second location! If you haven’t been to the new gallery, make sure to stop by. If you are unfamiliar with Ginger Fox’s work, you now have two galleries you can visit to check it out!